After the organism is inhaled into the lungs, the arthrospore develops into a thick-walled spherule that is filled with endospores (see the image below). Once the endospore is released, it can start the development of a new spherule, allowing the infection in the host to progress. Coccidioidomycosis is not known transmit from person to person. Coccidioides immitis spherule containing daughter spores. See A Chronic, Scaly Rash Mistaken for MRSA: Case Presentation, a Critical Images slideshow, to review additional images and details of a case of Coccidioidomycosis. C immitis can disseminate from the lungs and thoracic cavity to infect other organs, such as bone, joints, skin, and meninges. Dissemination usually occurs within weeks or months after the primary pneumonia. Imaging studies in patients with suspected or confirmed coccidioidomycosis include plain chest radiography, computed tomography (CT), magnetic resonance imaging (MRI), and, possibly, positron-emission tomography (PET). Chest radiography is readily available and is usually the first imaging study performed. It assists in clinical staging of the disease and is useful in following up the progression or resolution of the disease. However, chest radiographic findings are nonspecific and variable. 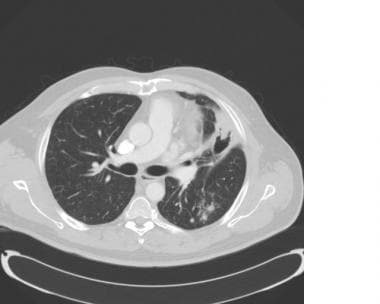 Chest radiographic findings alone are not diagnostic of thoracic coccidioidomycosis, because other infectious diseases and neoplastic processes may mimic the disorder. 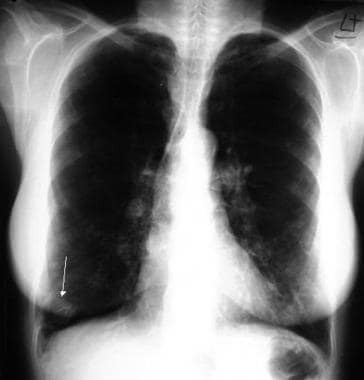 Chest radiography should be performed in all patients in whom coccidioidomycosis is suspected or confirmed, because of the possibility of pulmonary infection. In patients with suspected coccidioidal osteoporosis, plain radiographs of the affected bone are indicated. Asymptomatic patients may have normal chest radiographic findings, and a normal result generally excludes significant clinical disease. 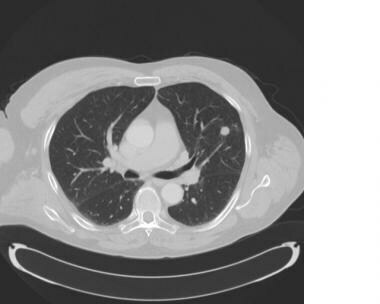 The chest radiographic findings may progress from single or multiple areas of airspace consolidation to the formation of nodules or cavities, which may further progress to diffuse reticulonodular lung disease and upper-lobe scarring. 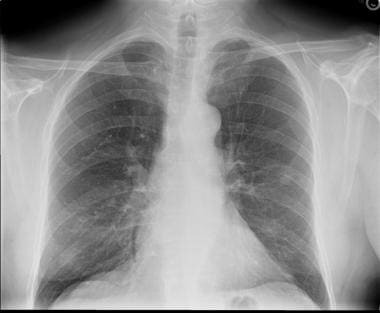 In some patients with disseminated disease, radiographs may not show evidence of previous pulmonary disease, and the patients will have no history of a preceding respiratory illness. Patients suspected of having meningitis should undergo neuroimaging studies. MRI is more sensitive than other studies to identify central nervous system involvement, and it is the preferred modality if spinal cord impingement is suspected. PET scans are increasingly used in the diagnosis and staging of invasive fungal infections, including coccidioidomycosis, and may be able to detect lesions that are not otherwise visualized with CT. The most common finding is a localized infiltrate. Less-common findings include diffuse reticulonodular disease, pleural effusion, hilar adenopathy, single or multiple cavities (thin-walled and usually apical), miliary disease, and pneumothorax with associated pleural effusion. Although the sensitivity of a chest radiographic finding is high in a patient from an area with endemic disease, the specificity is low. The chest radiograph may suggest coccidioidomycosis, but confirmation with another diagnostic test is mandatory. The chest radiographic patterns of coccidioidomycosis have a broad differential diagnosis; therefore, careful clinical evaluation and workup are recommended to exclude other disorders. 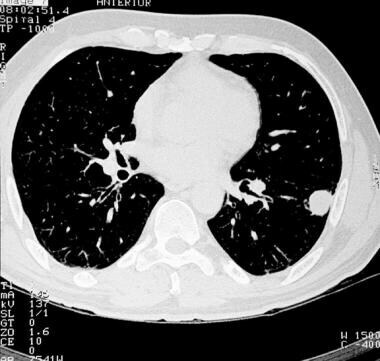 Pulmonary nodules may be better defined on CT scans of the lungs than on standard chest radiographs, and they may show marked enhancement after the intravenous administration of contrast material. Asymptomatic patients may have a normal chest radiograph or may have residual abnormalities of a previous infection, including parenchymal scarring, pleural thickening, calcified and uncalcified nodules, and lymph nodes (see the images below). 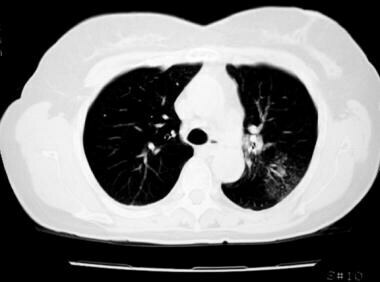 Lobar, segmental, or subsegmental infiltrates may be indistinguishable from those seen with acute pneumonia. Radiographic changes in primary coccidioidomycosis often resolve spontaneously, albeit slowly. Parenchymal consolidation is the most common manifestation, being seen in 75% of patients. The segmental or subsegmental consolidation may be single or multiple; it is usually unilateral and in perihilar or basal distribution. It may resolve spontaneously within 1-2 weeks. Calcifications occur in the minority of lesions (< 15%). Parenchymal consolidation can demonstrate a migratory pattern, resolving at one site and appearing at another. This has been termed "phantom infiltrates." A large, masslike airspace lesion is seen in the right lower lobe. The lesion is secondary to the progressive, infectious form of coccidioidomycosis. Another case of extensive airspace consolidation resulting from coccidioidomycosis. 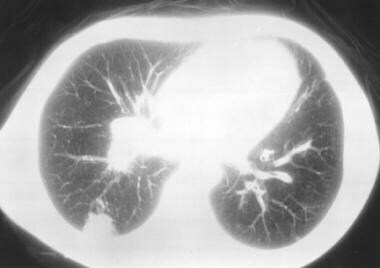 In 20% of patients, nodular lung disease is seen (see the images below). The nodules frequently are well-defined, simulating metastases, or they may have ill-defined margins. They have a parahilar and lower-lobe distribution and are 5-25 mm in size. Right-lower-lobe nodule secondary to the disease. Coccidioidomycosis nodule, left upper lobe. CT imaging may provide better definition of the nodule. Fluorodeoxyglucose positron-emission tomography (FDG-PET) scans may demonstrate intense uptake in nodules, similar to malignancy, but uptake may also be mild; thus, FDG-PET scanning cannot be used to distinguish between malignant and coccidioidomas in an endemic area. Hilar adenopathy is seen in approximately 20-25% of patients with coccidioidomycosis. It is usually unilateral and concomitant with parenchymal lesions. The constellation of an infiltrate and hilar adenopathy in a patient from an endemic area should raise suspicion for coccidioidal pneumonia. Paratracheal or mediastinal adenopathy can also be seen, and its appearance is often a precursor to disseminated disease. Pleural effusion is seen in 5-15% of patients, although pleuritic chest pain occurs more frequently (in 50-75% of cases), as determined clinically. The effusion usually is small, although a massive effusion in children may suggest more severe disease, and it may even represent evidence of acute dissemination. Effusions are more often left sided, transudative, and eosinophilic on analysis. Empyema can also occur, with diagnosis confirmed by thoracentesis. Bronchopleural fistulas and secondary spontaneous pneumothoraces have also been reported. Scattered patchy infiltrates called persistent coccidioidal pneumonia are a less common presentation and may require as long as 1-2 months to resolve. Diffuse pneumonia is unusual and may represent a large inhalation of arthrospores or severe underlying immunodeficiency. Findings may suggest acute respiratory distress syndrome or a miliary (ie, resembling millet seed) pattern with multiple, small, bilateral nodular densities. This pattern is also seen in disseminated disease. 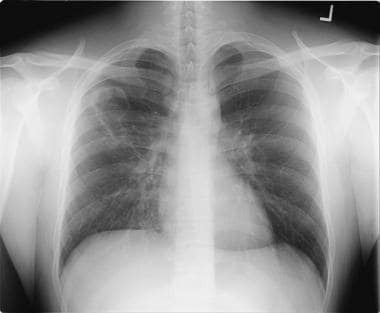 Diffuse miliary lesions on chest radiography are associated with rapid clinical deterioration and death. Approximately 5% of patients may develop a persistent pulmonary disease when the primary disease is present for longer than 6 weeks. Persistent disease may last longer than 3 months. 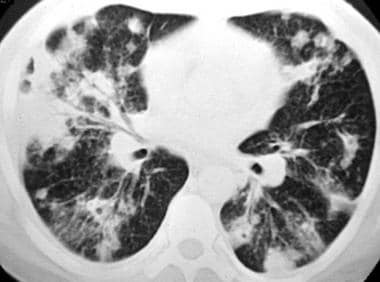 This disease may include persistent pneumonia with or without adenopathy, nodules and cavities, pleural disease, bronchiectasis, empyema, or calcifications. Only 25% of patients with chronic changes have a history that is suggestive of an antecedent acute primary pulmonary coccidioidal illness. Dense segmental and lobar consolidation is the most common finding. It can be unifocal or multifocal and is sometimes bilateral with cavitary regions. Findings of chronic coccidioidomycosis may resemble those seen in pulmonary tuberculosis, with associated infiltrates and fibrosis. Bronchiectasis may be seen in 1-2% of patients. Persistent coccidioidal pneumonia generally occurs in a severely ill patient with dense, extensive consolidation. Chronic, progressive coccidioidal pneumonia occurs in less than 1% of patients. It mimics chronic pulmonary tuberculosis or histoplasmosis both clinically and radiographically. However, patients do have the chronic presence of C immitis on sputum cultures. Apical fibronodular lesions with cavities and volume loss are seen on radiographs, which generally show dramatic resolution with amphotericin B treatment. Depending on the size of the consolidation, 3-21 months may be required for its resolution. Despite the slow resolution, fibrosis is less common. In immunocompromised patients with persistent pneumonia, the clinical symptoms become severe or even fatal in two thirds of cases. 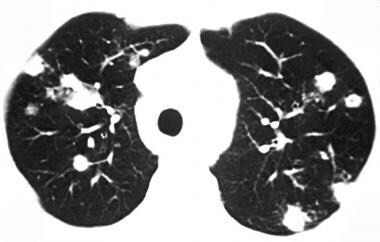 Pulmonary nodules are the most common radiographic findings in persistent pulmonary infection. Nodular lesions (coccidioidomas) represent localized foci of incompletely resolved consolidation. Nodules may also form from filling in of a cavity. Nodules usually are well circumscribed and round, averaging 1.5-2 cm. They usually are single, and they tend to occur in the periphery of middle and upper lung zones. In contrast to the nodules in tuberculosis, these nodules may develop in the anterior segment of an upper lobe. The nodules may remain stable for months and eventually regress; only rarely is slow growth observed. Cavities may develop as a result of necrosis in an area of pneumonia or may be produced by excavation of a nodule. Cavities that have been created by means of excavation have been reported in 10-15% of patients. A solitary, thin-walled cavity is a common residual finding of coccidioidal infection (see the images below). Many thin-walled cavities on plain chest radiographs prove to be thick-walled cavities when visualized on CT scans. Approximately half of cavities resolve spontaneously within 2 years. Cavities smaller than 2.5 cm are most likely to resolve; large cavities (>5 cm) may persist and may result in symptoms. A rapid change in the size of a cavity suggests coccidioidal infection rather than any other granulomatous infection. Thin-walled coccidioidomycosis cavity, right upper lobe. Cavities may produce pleuritic pain, cough, or hemoptysis. Mycetoma may develop in the cavities as a result of infection with mycelia of C immitis or other fungi, such as Aspergillus species. The cavities may wax and wane over the years, possibly due to a check-valve mechanism. This finding is suggestive of coccidioidal infection. A subpleural cavity may break down into the pleural cavity, causing a pneumothorax, pyopneumothorax, or bronchopleural fistula. The rupture of a peripheral coccidioidal cavity into the pleural space is a complication that is most common in young male patients. An air-fluid level in the pleural space is a clue that the process is not a spontaneous pneumothorax. In the past, these cavities often were surgically resected. However, the use of surgical treatment has diminished since the advent of effective antifungal therapy. 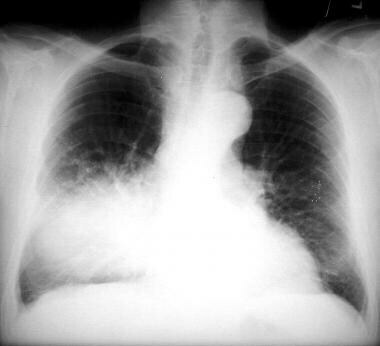 Some patients develop a chronic fibrotic pneumonia process characterized by both pulmonary infiltrates and pulmonary cavitation. Involvement of more than one pulmonary lobe is more common. Chronic fibrocavitary pneumonia appears to be associated with diabetes mellitus or preexisting pulmonary fibrosis related to cigarette smoking or other causes. Patients may have systemic symptoms, such as fever, night sweats, and weight loss, as well as local symptoms. Disseminated coccidioidomycosis may occur as a complication of primary illness, a late complication of chronic coccidioidomycosis, or a reactivation of latent disease in susceptible individuals. Dissemination of infection occurs hematogenously to the lungs and extrathoracic organs. Although the disease may affect any organ of the body, the principal sites of involvement are the skin, bones, joints, kidneys, and meninges. Hilar and mediastinal adenopathy are almost always associated with disseminated disease. Mediastinal adenopathy is often seen as bulky paratracheal adenopathy (see the image below). Lung biopsy is usually required for diagnosis. The radiographic manifestations of dissemination include a miliary pattern that resembles miliary tuberculosis, although the nodules in coccidioidomycosis are less well defined. A miliary pattern is an ominous sign that represents the development of small granulomas throughout the lung (and other organs). It can occur in immunocompromised or immunocompetent hosts. The differential diagnoses for the miliary pattern include other mycotic infections, tuberculosis, silicosis, sarcoidosis, and metastatic disease. Acute respiratory distress syndrome (ARDS) is an infrequent complication in immunocompromised hosts. Pericardial involvement may lead to pericardial effusion, cardiac tamponade, or constrictive pericarditis. An enlarged cardiac silhouette represents pericardial involvement and a pericardial effusion. In select cases of coccidioidomycosis, CT scanning (see the images below) is more useful than other modalities in defining the morphology of the lesions that are seen on chest radiographs. Examples of abnormalities that chest CT scanning helps better define following chest radiography are airway disease, such as endotracheal or endobronchial coccidioidal granulomas; mediastinal adenopathy (paratracheal and mediastinal); pericardial disease; pulmonary nodules; cavitary disease and pneumatoceles; mycetomas residing in chronic cavities; pleural effusion and empyema; hydropneumothorax; and bronchiectasis. Neuroimaging studies on CT or MRI should be performed in patients suspected of having meningitis; however, in such cases, CT scanning is considered to be less sensitive than MRI. CT or MRI of the brain in patients with CNS involvement may demonstrate basilar meningeal enhancement, granulomas, or abscesses. CT imaging provides information on bony destruction that is more precise than that of MRI. Computed tomography scan shows a nodule and an airspace infiltrate. 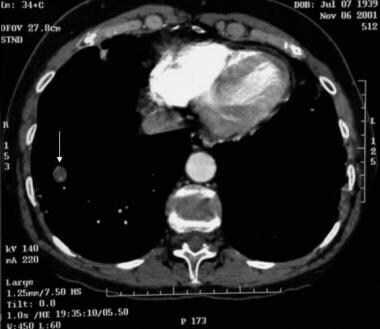 Computed tomography scan shows a calcified nodule in the right lower lobe of an individual who traveled to Arizona 3 years previously. In comparison with tuberculosis, coccidioidomas are less commonly associated with calcification. 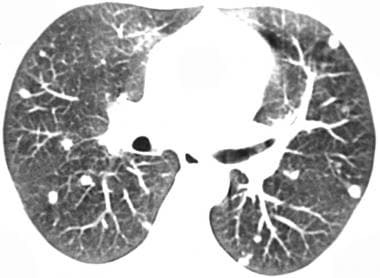 Computed tomography scan shows a nodule in the left lower lobe at the level of the left lower bronchus take-off. A percutaneous needle biopsy confirmed coccidioidomycosis. Computed tomography scan shows consolidation with central necrosis. Pulmonary nodule from infection with Coccidioides species. CT scan of the chest. Photograph by Preeyacha Pacham, MD. 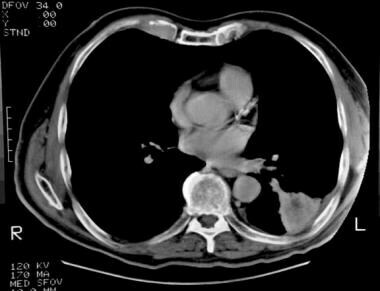 In a study by Capone et al of 15 patients evaluated with chest CT scans for acute pulmonary coccidioidomycosis, the main findings were multiple nodules, interlobular septal thickening, consolidation, lymph node enlargement, and, less frequently, pleural effusion. Nodules ranged from 0.5-3 cm in diameter and showed ill-defined contours and nodule coalescence. More than 75% of patients presented with more than 20 nodules, and all patients with nodular presentations had more than 10 nodules with cavitation. In 73% of cases, these nodules were adjacent to the pleural surface. None showed calcification. About 40% of the cases showed mediastinal and/or hilar lymph nodes of more than 1 cm in diameter. The MRI appearance of coccidioidomycosis varies; findings may include heterogeneous marrow signal intensity and soft tissue involvement. MRI may help delineate the extent of bone, joint, and overlying soft tissue involvement, including sinus tracts or fistulae. A bone scan may detect multiple sites of bony involvement. Neuroimaging studies, such as CT and MRI scans, should be performed in patients suspected of having meningitis. MRI is more sensitive than other studies for CNS involvement, yielding positive findings in approximately 75% of patients with coccidioidal meningitis, whereas CT scanning yields only 42%. The 3 most common findings include hydrocephalus with ventricular enlargement, basilar meningitis, and vascular occlusion. The detection of hydrocephalus and vascular occlusion has negative prognostic implications. MRI is the preferred modality if spinal cord impingement is suspected and is useful in establishing the extent of disease and in planning surgical debridement of infected areas. MRI may be better than CT in evaluating the patency of the aqueduct of Sylvius. Cerebral infarctions can also be seen in coccidioidal meningitis. Fluorodeoxyglucose PET (FDG-PET) scanning can help identify areas of active coccidioidal infection. Intense diffuse uptake is seen in patients with disseminated coccidioidomycosis. Solitary nodules may have uptake indistinguishable from malignancy, and long-standing granulomas may have little or no uptake. 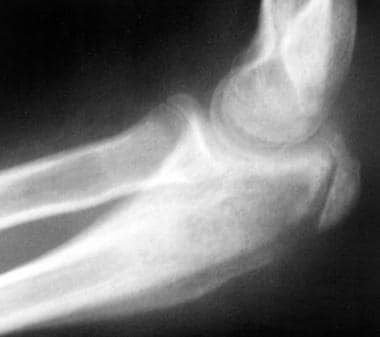 Osteomyelitis may result from hematogenous spread of coccidioidomycosis. It may involve any part of the skeleton but disproportionately affects the vertebrae; paraspinal abscesses are a possible complication. Other common sites of involvement include the tibia, femur, skull, and bones of the hands and feet. Coccidioidal osteomyelitis of the right elbow. Plain film radiograph. Photograph by Preeyacha Pacham, MD. Moffat A, Lovecchio F. Presentations of coccidioidomycosis in the ED. Am J Emerg Med. 2016 Jan 28. [Medline]. Johnson RH, Caldwell JW, Welch G. The great coccidioidomycosis epidemic: clinical features. Einstein HE, ed. Coccidioidomycosis. Bethesda, Md: National Foundation for Infectious Diseases; 1996. 77-87. Cummings KC, McDowell A, Wheeler C, McNary J, Das R, Vugia DJ, et al. Point-source outbreak of coccidioidomycosis in construction workers. Epidemiol Infect. 2010 Apr. 138(4):507-11. [Medline]. Lauer A, Baal JD, Baal JC, Verma M, Chen JM. Detection of Coccidioides immitis in Kern County, California, by multiplex PCR. Mycologia. 2012 Jan-Feb. 104(1):62-9. [Medline]. Jude CM, Nayak NB, Patel MK, Deshmukh M, Batra P. Pulmonary coccidioidomycosis: pictorial review of chest radiographic and CT findings. Radiographics. 2014 Jul-Aug. 34 (4):912-25. [Medline]. Lammering JC, Iv M, Gupta N, Pandit R, Patel MR. Imaging spectrum of CNS coccidioidomycosis: prevalence and significance of concurrent brain and spinal disease. AJR Am J Roentgenol. 2013 Jun. 200(6):1334-46. [Medline]. Taljanovic MS, Adam RD. Musculoskeletal coccidioidomycosis. Semin Musculoskelet Radiol. 2011 Nov. 15(5):511-26. [Medline]. Parish JM, Blair JE. Coccidioidomycosis. Mayo Clin Proc. 2008 Mar. 83(3):343-48; quiz 348-9. [Medline]. American Academy of Pediatrics. Coccidioidomycosis. Pickering LK, Baker CJ, Kimberlin DW, Long SS, eds. Red Book: 2009 Report of the Committee on Infectious Diseases. 28th ed. ElkGrove Village, IL: American Academy of Pediatrics; 2009. 266-268. Galgiani JN, Ampel NM, Blair JE, Catanzaro A, Johnson RH, Stevens DA, et al. Coccidioidomycosis. Clin Infect Dis. 2005 Nov 1. 41(9):1217-23. [Medline]. Kleiman MB. 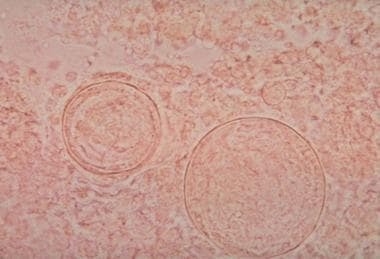 Coccidioides immitis and Coccidiodes posadasii (Coccidiodomycosis). Long SS, Pickering LK, Prober CG. Principles and Practice of Pediatric Infectious Disease. 3rd ed. Philadelphia: Churchill Livingstone; 2008. 1213-1217. Spinello IM, Munoz A, Johnson RH. Pulmonary coccidioidomycosis. Semin Respir Crit Care Med. 2008 Apr. 29(2):166-73. [Medline]. Kwok HK, Chan JW, Li IW, Chu SY, Lam CW. Coccidioidomycosis as a rare cause of pneumonia in non-endemic areas: a short exposure history should not be ignored. Respirology. 2009 May. 14(4):617-20. [Medline]. Adam RD, Elliott SP, Taljanovic MS. The spectrum and presentation of disseminated coccidioidomycosis. Am J Med. 2009 Aug. 122(8):770-7. [Medline]. Blair JE. State-of-the-art treatment of coccidioidomycosis: skin and soft-tissue infections. Ann N Y Acad Sci. 2007 Sep. 1111:411-21. [Medline]. Read CT. 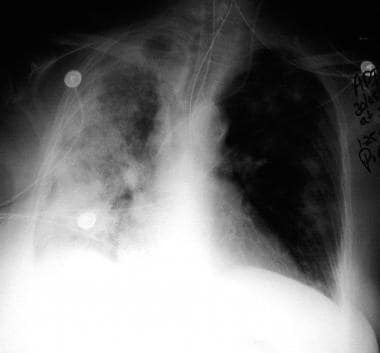 Coin lesion, pulmonary: in the Southwest. (Solitary pulmonary nodules). Ariz Med. 1972 Oct. 29(10):775-81. [Medline]. Polesky A, Kirsch CM, Snyder LS, LoBue P, Kagawa FT, Dykstra BJ, et al. Airway coccidioidomycosis--report of cases and review. Clin Infect Dis. 1999 Jun. 28(6):1273-80. [Medline]. Jude CM, Nayak NB, Patel MK, Deshmukh M, Batra P. Pulmonary Coccidioidomycosis: Pictorial Review of Chest Radiographic and CT Findings. Radiographics. 2014 Jul-Aug. 34(4):912-25. [Medline]. Kim KI, Leung AN, Flint JD, Müller NL. Chronic pulmonary coccidioidomycosis: computed tomographic and pathologic findings in 18 patients. Can Assoc Radiol J. 1998 Dec. 49(6):401-7. [Medline]. Capone D, Marchiori E, Wanke B, Dantas KE, Cavalcanti MA, Deus Filho A, et al. 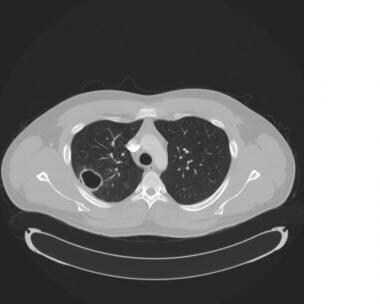 Acute pulmonary coccidioidomycosis: CT findings from 15 patients. Br J Radiol. 2008 Sep. 81(969):721-4. [Medline]. Sachdeva M, Ronaghi R, Mills PK, Peterson MW. Complications and Yield of Computed Tomography-Guided Transthoracic Core Needle Biopsy of Lung Nodules at a High-Volume Academic Center in an Endemic Coccidioidomycosis Area. Lung. 2016 Mar 15. [Medline]. Hot A, Maunoury C, Poiree S, Lanternier F, Viard JP, Loulergue P, et al. Diagnostic contribution of positron emission tomography with [18F]fluorodeoxyglucose for invasive fungal infections. Clin Microbiol Infect. 2011 Mar. 17(3):409-17. [Medline]. Reyes N, Onadeko OO, Luraschi-Monjagatta Mdel C, Knox KS, Rennels MA, Walsh TK, et al. Positron emission tomography in the evaluation of pulmonary nodules among patients living in a coccidioidal endemic region. Lung. 2014 Aug. 192 (4):589-93. [Medline]. Bilateral reticular-nodular infiltrates in a patient with progressive coccidioidomycosis. 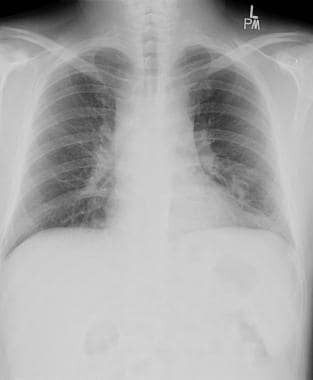 Chest radiograph of a patient who winters in Arizona, presenting with symptoms of a cough and fever, as well as an airspace masslike opacity. Several months later, spontaneous clinical improvement was noted in the patient in the previous image. The infiltrate has now evolved into a well-defined nodule. Nodule in the left upper lobe of a patient who visited Arizona during the winter months. A needle biopsy revealed coccidioidomycosis. A close-up view of the chest radiograph in the previous image. 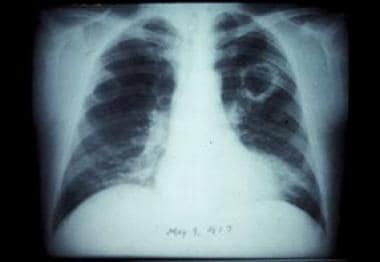 A masslike opacity in the superior segment of the left lower lobe is noted in a patient with cough, fever, and chills. Fungal cultures from bronchoalveolar lavage confirmed the diagnosis of coccidioidomycosis. Chronic persistent coccidioidomycosis cavity, left upper lobe. Coccidioidomycosis. Acute respiratory distress syndrome and large right pneumatocele.